The John F. Kennedy Space Center (KSC, originally known as the NASA Launch Operations Center) is one of ten National Aeronautics and Space Administration field centers. Since December 1968, Kennedy Space Center has been NASA's primary launch center of human spaceflight. Launch operations for the Apollo, Skylab and Space Shuttle programs were carried out from Kennedy Space Center Launch Complex 39 and managed by KSC. Located on the east coast of Florida, KSC is adjacent to Cape Canaveral Air Force Station (CCAFS). The management of the two entities work very closely together, share resources, and even own facilities on each other's property. Though the first Apollo flights, and all Project Mercury and Project Gemini flights took off from CCAFS, the launches were managed by KSC and its previous organization, the Launch Operations Directorate. Starting with the fourth Gemini mission, the NASA launch control center in Florida (Mercury Control Center, later the Launch Control Center) began handing off control of the vehicle to the Mission Control Center shortly after liftoff; in prior missions it held control throughout the entire mission. Additionally, the center manages launch of robotic and commercial crew missions and researches food production and In-Situ Resource Utilization for off-Earth exploration. Since 2010, the center has worked to become a multi-user spaceport through industry partnerships, even adding a new launch pad (LC-39C) in 2015. There are about 700 facilities and buildings grouped across the center's 144,000 acres. Among the unique facilities at KSC are the 525 ft tall Vehicle Assembly Building for stacking NASA's largest rockets, the Launch Control Center, which conducts space launches at KSC, the Operations and Checkout Building, which houses the astronauts dormitories and suit-up area, a Space Station factory, and a 3-mile-long Shuttle Landing Facility. There is also a Visitor Complex open to the public on site. NASA began land acquisition in 1962, buying title to 131 square miles (340 km2) and negotiating with the state of Florida for an additional 87 square miles (230 km2). 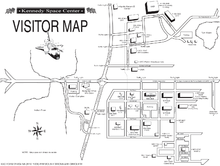 The major buildings in KSC's Industrial Area were designed by architect Charles Luckman. Construction began in November 1962, and Kennedy visited the site twice in 1962, and again just a week before his assassination on November 22, 1963. On November 29, 1963, the facility was given its current name by President Lyndon B. Johnson under Executive Order 11129. Johnson's order joined both the civilian LOC and the military Cape Canaveral station ("the facilities of Station No. 1 of the Atlantic Missile Range") under the designation "John F. Kennedy Space Center", spawning some confusion joining the two in the public mind. 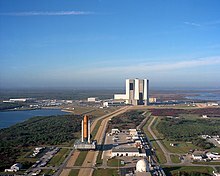 NASA Administrator James E. Webb clarified this by issuing a directive stating the Kennedy Space Center name applied only to the LOC, while the Air Force issued a general order renaming the military launch site Cape Kennedy Air Force Station. 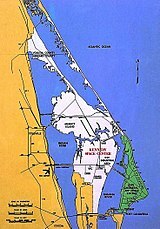 Because much of the installation is a restricted area and only nine percent of the land is developed, the site also serves as an important wildlife sanctuary; Mosquito Lagoon, Indian River, Merritt Island National Wildlife Refuge and Canaveral National Seashore are other features of the area. Center workers can encounter bald eagles, American alligators, wild boars, eastern diamondback rattlesnakes, the endangered Florida panther and Florida manatees. As the Space Shuttle was being designed, NASA received proposals for building alternative launch-and-landing sites at locations other than KSC, which demanded study. KSC had important advantages, including: its existing facilities; location on the Intracoastal Waterway; and its southern latitude, which gives a velocity advantage to missions launched in easterly near-equatorial orbits. 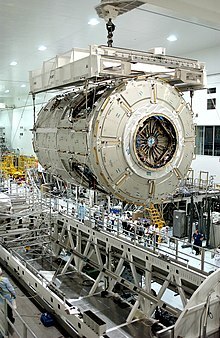 Disadvantages included: its inability to safely launch military missions into polar orbit, since spent boosters would be likely to fall on the Carolinas or Cuba; corrosion from the salt air; and frequent cloudy or stormy weather. Although building a new site at White Sands Missile Range in New Mexico was seriously considered, NASA announced its decision in April 1972 to use KSC for the shuttle. Since the Shuttle could not be landed automatically or by remote control, the launch of Columbia on April 12, 1981 for its first orbital mission STS-1, was NASA's first manned launch of a vehicle that had not been tested in prior unmanned launches. KSC's 2.9-mile (4.7 km) Shuttle Landing Facility (SLF) was the orbiters' primary end-of-mission landing site, although the first KSC landing did not take place until the tenth flight, when Challenger completed STS-41-B on February 11, 1984; the primary landing site until then was Edwards Air Force Base in California, subsequently used as a backup landing site. The SLF also provided a return-to-launch-site (RTLS) abort option, which was not utilized. The SLF is among the longest runways in the world. Beginning in 1958, NASA and military worked side by side on robotic mission launches (previously referred to as unmanned), cooperating as they broke ground in the field. In the early 1960s, NASA had as many as two robotic mission launches a month. The frequent number of flights allowed for quick evolution of the vehicles, as engineers gathered data, learned from anomalies and implemented upgrades. In 1963, with the intent of KSC ELV work focusing on the ground support equipment and facilities, a separate Atlas/Centaur organization was formed under NASA's Lewis Center (now Glenn Research Center (GRC)), taking that responsibility from the Launch Operations Center (aka KSC). Though almost all robotics missions launched from the Cape Canaveral Air Force Station (CCAFS), KSC "oversaw the final assembly and testing of rockets as they arrived at the Cape." In 1965, KSC's Unmanned Launch Operations directorate became responsible all NASA unmanned launch operations, including those at Vandenberg Air Force Base. From the 1950s to 1978, KSC chose the rocket and payload processing facilities for all robotic missions launching in the U.S., overseeing their near launch processing and checkout. In addition to government missions, KSC performed this service for commercial and foreign missions also, though non-U.S. government entities provided reimbursement. NASA also funded CCAFS launch pad maintenance and launch vehicle improvements. All this changed with the Commercial Space Launch Act of 1984, after which NASA only coordinated its own and National Oceanic and Atmospheric Administration (NOAA) ELV launches. Companies were able to "operate their own launch vehicles" and utilize NASA's launch facilities. Payload processing handled by private firms also started to occur outside of KSC. Reagan's 1988 space policy furthered the movement of this work from KSC to commercial companies. That same year, launch complexes on CCAFS started transferring from NASA to air force management. In the 1990s, though KSC was not performing the hands-on ELV work, engineers still maintained understanding of ELVs and had contracts allowing them insight in the vehicles so they could provide knowledgeable oversight. KSC also worked on ELV research and analysis and the contractors were able to utilize KSC personnel as a resource for technical issues. KSC, with the payload and launch vehicle industries, developed advances in automation of the ELV launch and ground operations for the purpose of enabling competitiveness of U.S. rockets against the global market. As the International Space Station modules design began in the early 1990s, KSC began to work with other NASA centers and international partners to prepare for processing prior to launch on board the Space Shuttles. KSC utilized its hands-on experience processing the 22 Spacelab missions in the Operations and Checkout Building to gather expectations of ISS processing. These experiences were incorporated into the design of the Space Station Processing Facility (SSPF), which began construction in 1991. The Space Station Directorate formed in 1996. KSC personnel were embedded at station module factories for insight into their processes. Today KSC continues to process ISS payloads from across the world prior to launch along with developing its own experiments for on orbit. The future Lunar Orbital Platform-Gateway Space Station will be manufactured and processed at the Space Station Processing Facility. On December 5, 2014, NASA launched the first unmanned flight test of the Orion Multi-Purpose Crew Vehicle (MPCV), currently under development to facilitate human exploration of the Moon, asteroids, and Mars. The KSC Industrial Area, where many of the center's support facilities are located, is 5 miles (8 km) south of LC-39. It includes the Headquarters Building, the Operations and Checkout Building and the Central Instrumentation Facility. The astronaut crew quarters are in the O&C; before it was completed, the astronaut crew quarters were located in Hangar S at the Cape Canaveral Missile Test Annex (now CCAFS). Located as KSC was the Merritt Island Spaceflight Tracking and Data Network station (MILA), a key radio communications and spacecraft tracking complex. Facilities at the Kennedy Space Center are directly related to its mission to launch and recover missions. Facilities are available to prepare and maintain spacecraft and payloads for flight. The Headquarters (HQ) Building houses offices for the Center Director, library, film and photo archives, a print shop and security. A new Headquarters Building is under construction as a part of the Central Campus consolidation and the first phase is expected to be complete in 2017. The center operated its own 17-mile (27 km) short-line railroad. This operation was discontinued in 2015, with the sale of its final two locomotives. A third had already been donated to a museum. The line was costing $1.3 million annually to maintain. The Operations and Checkout Building (O&C) (previously known as the Manned Spacecraft Operations Building) is a historic site on the U.S. National Register of Historic Places dating back to the 1960s and was used to receive, process, and integrate payloads for the Gemini and Apollo programs, the Skylab program in the 1970s, and for initial segments of the International Space Station through the 1990s. The Apollo and Space Shuttle astronauts would board the astronaut transfer van to launch complex 39 from the O&C building. The three-story, 457,000-square-foot (42,500 m2) Space Station Processing Facility (SSPF) consists of two processing bays, an airlock, operational control rooms, laboratories, logistics areas and office space for support of non-hazardous Station and Shuttle payloads to ISO 14644-1 class 5 standards. The Vertical Processing Facility (VPF) features a 71-by-38-foot (22 by 12 m) door where payloads which are processed in the vertical position are brought in and manipulated with two overhead cranes and a hoist capable of lifting up to 35 short tons (32 t). The Hypergolic Maintenance and Checkout Area (HMCA) comprises three buildings which are isolated from the rest of the industrial area because of the hazardous materials handled there. Hypergolic-fueled modules that made up the Space Shuttle Orbiter's reaction control system, orbital maneuvering system and auxiliary power units were stored and serviced in the HMCF. The Payload Hazardous Servicing Facility contains a 70-by-110-foot (21 by 34 m) service bay, with a 50-short-ton (45,000 kg), 85-foot (26 m) hook height. It also contains a 58-by-80-foot (18 by 24 m) payload airlock. Its temperature is maintained at 70 °F (21 °C). the Vehicle Assembly Building (VAB), a 130,000,000 cubic feet (3,700,000 m3) hangar capable of holding four Saturn Vs. The VAB is the fourth-largest structure in the world by volume, and was the largest when completed in 1965. The Kennedy Space Center Visitor Complex, operated by Delaware North since 1995, has a variety of exhibits, artifacts, displays and attractions on the history and future of human and robotic spaceflight. Bus tours of KSC originate from here. The complex also includes the separate Apollo/Saturn V Center, north of the VAB and the United States Astronaut Hall of Fame, six miles west near Titusville. There were 1.5 million visitors in 2009. It had some 700 employees. It was announced on May 29, 2015 that the Astronaut Hall of Fame exhibit would be moved from its current location to another location within the Visitor Complex to make room for an upcoming high-tech attraction entitled "Heroes and Legends". The attraction, to be designed by Orlando-based design firm Falcon's Treehouse, is slated to open sometime late 2016. In March 2016, the visitor center unveiled the new location of the iconic countdown clock at the complex's entrance; previously, the clock was located with a flagpole at the press site. The clock was originally built and installed in 1969 and listed with the flagpole in the National Register of Historic Places in January 2000. In 2019, NASA celebrates the 50th anniversary of the Apollo Program, and the launch of Apollo 10 on May 18. In summer of 2019, Lunar Module 9 (LM-9) will be relocated to the Apollo/Saturn V Center as part of an initiative to rededicate the center and celebrate the 50th anniversary of the Apollo Program. There are 24 historic properties outside of these historic districts, including the Space Shuttle Atlantis, Vehicle Assembly Building, Crawlerway, and Operations and Checkout Building. KSC has one National Historic Landmark, 78 National Register of Historic Places (NRHP) listed or eligible sites, and 100 Archaeological Sites. Florida's peninsular shape and temperature contrasts between land and ocean provide ideal conditions for electrical storms, earning Central Florida the reputation as "lightning capital of the United States". This makes extensive lightning protection and detection systems necessary to protect employees, structures and spacecraft on launch pads. On November 14, 1969, Apollo 12 was struck by lightning just after lift-off from Pad 39A, but the flight continued safely. The most powerful lightning strike recorded at KSC occurred at LC-39B on August 25, 2006, while shuttle Atlantis was being prepared for STS-115. NASA managers were initially concerned that the lightning strike caused damage to Atlantis, but none was found. On September 7, 2004, Hurricane Frances directly hit the area with sustained winds of 70 miles per hour (110 km/h) and gusts up to 94 miles per hour (151 km/h), the most damaging storm to date. The Vehicle Assembly Building lost 1,000 exterior panels, each 3.9 feet (1.2 m) x 9.8 feet (3.0 m) in size. This exposed 39,800 sq ft (3,700 m2) of the building to the elements. Damage occurred to the south and east sides of the VAB. The shuttle's Thermal Protection System Facility suffered extensive damage. The roof was partially torn off and the interior suffered water damage. Several rockets on display in the center were toppled. Further damage to KSC was caused by Hurricane Wilma in October 2005. In May 1965, KSC had 7,000 employees and contractors move from rented space in Cocoa Beach to the new Merritt Island facilities. The peak number of persons working on center was 26,000 in 1968 (3,000 were civil servants). In 1970, President Nixon announced intent to reduce cost of space operations and major cuts occurred at KSC. By 1974, KSC's workforce was down to 10,000 employees (2,408 civil servants). A total of 13,100 people worked at the center as of 2011. Approximately 2,100 are employees of the federal government; the rest are contractors. The average annual salary for an on-site worker in 2008 was $77,235. The end of the Space Shuttle program in 2011, preceded by the cancellation of Constellation Program in 2010, produced a significant downsizing of the KSC workforce similar to that experienced at the end of the Apollo program in 1972. As part of this downsizing, 6,000 contractors lost their jobs at the Center during 2010 and 2011. ^ "Kennedy Business Report" (PDF). Annual Report FY2010. NASA. February 2011. Retrieved August 22, 2011. ^ "Kennedy Space Center Implementing NASA's Strategies" (PDF). NASA. 2000. Retrieved November 5, 2015. ^ "APPENDIX 10 - GOVERNMENT ORGANIZATIONS SUPPORTING PROJECT MERCURY". NASA History Program Office. NASA. Retrieved November 6, 2015. ^ "2. PROJECT SUPPORT FROM THE NASA Centers". MERCURY PROJECT SUMMARY (NASA SP-45). NASA. Retrieved November 6, 2015. ^ "Mercury Mission Control". NASA. Retrieved November 6, 2015. ^ a b c d e f g h Lipartito, Kenneth; Butler, Orville (2007). 'A History of the Kennedy Space Center. University Press of Florida. ISBN 978-0-8130-3069-2. ^ a b "Research & Technology". Kennedy Space Center. NASA. Retrieved November 5, 2015. ^ "NASA Partnerships Launch Multi-User Spaceport". NASA. May 1, 2014. Retrieved November 5, 2015. ^ a b "Kennedy Creating New Master Plan". NASA. March 12, 2012. Retrieved November 5, 2015. ^ Charles D. Benson and William Barnaby Faherty. "Land, Lots of Land – Much of It Marshy". 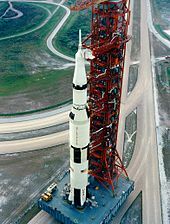 Moonport: A History of Apollo Launch Facilities and Operations. NASA. Retrieved August 27, 2009. ^ Muschamp, Herbert (January 28, 1999). "Charles Luckman, Architect Who Designed Penn Station's Replacement, Dies at 89". The New York Times. Retrieved August 22, 2011. ^ a b "Kennedy History Quiz". NASA. Retrieved November 5, 2015. ^ "Kennedy Space Center Story". NASA. 1991. Retrieved November 5, 2015. ^ Benson, Charles D.; Faherty, William B. (August 1977). "Chapter 7: The Launch Directorate Becomes an Operational Center - Kennedy's Last Visit". Moonport: A History of Apollo Launch Facilities and Operations. History Series. SP-4204. NASA. ^ Heppenheimer, T. A. (1998). The Space Shuttle Decision. NASA. pp. 425–427. Archived from the original on October 30, 2004. ^ Shuttle Landing Facility (SLF). Science.ksc.nasa.gov. Retrieved on May 5, 2012. ^ "Style Guide for NASA History Authors and Editors". NASA's History Office. NASA. Retrieved November 6, 2015. ^ "Presidential Directive on National Space Policy". NASA. White House. February 11, 1988. Retrieved November 6, 2015. ^ a b "Kennedy Space Center Payload Processing". NASA. Retrieved November 5, 2015. ^ "Kennedy Space Center". NASA. Retrieved November 5, 2015. ^ "Commercial Crew Program". NASA. Retrieved November 5, 2015. ^ "Exploration Ground Systems". NASA. Retrieved October 13, 2018. ^ Garcia, Mark (April 12, 2015). "Orion Overview". NASA. Retrieved January 17, 2017. ^ "Orion Explained: NASA's Multi-Purpose Crew Vehicle (Infographic)". Space.com. Retrieved January 17, 2017. ^ "Launching Rockets". NASA. Retrieved November 5, 2015. ^ "Small Satellite Missions". NASA. Retrieved November 5, 2015. ^ "Hangar S History". Kennedy Space Center. NASA. Retrieved November 5, 2015. ^ "iv. Kennedy Space Center Planning and Development Office – What We Offer – Physical Assets". Archived from the original on April 4, 2014. Retrieved March 4, 2014. ^ "Kennedy Space Center Resource Encyclopedia". NASA - Kennedy Space Center. 2010. Retrieved March 4, 2014. ^ Headquarters Building (HQ). Science.ksc.nasa.gov. Retrieved on May 5, 2012. ^ "Kennedy Space Center Central Campus". NASA. Retrieved February 3, 2016. ^ "Central Campus of the Kennedy Space Center" (PDF). Kennedy Space Center Fact Sheets. NASA. Retrieved February 3, 2016. ^ "Media Invited to Groundbreaking for New Kennedy Space Center Headquarters". NASA. October 2, 2014. Retrieved November 5, 2015. ^ "The NASA Railroad" (PDF). Kennedy Space Center Fact Sheets. NASA. Retrieved February 3, 2016. ^ Dean, James (May 24, 2015). "NASA Railroad rides into sunset". Florida Today. Melbourne, Florida. pp. 25A. Retrieved June 2, 2015. ^ "Operations and Checkout Building". ^ Mansfield, Cheryl L. (July 15, 2008). "Catching a Ride to Destiny". NASA. Retrieved July 13, 2009. ^ Space Station Processing Facility (SSPF). Science.ksc.nasa.gov. Retrieved on May 5, 2012. ^ Vertical Processing Facility. Science.ksc.nasa.gov. Retrieved on May 5, 2012. ^ "Hypergolic Maintenance and Checkout Facility". ^ "Payload Hazardous Servicing Facility". Science.ksc.nasa.gov. Retrieved May 2, 2018. ^ "Senate". Congressional Record: 17598. September 8, 2004. ^ "Partnering with KSC". Archived from the original on November 4, 2015. ^ "The Front Page Archive". Doing Business With Kennedy. NASA. Retrieved November 5, 2015. ^ "Solar Energy Centers". FPL. ^ "Space Coast Next Generation Solar Energy Center". Sustainability. NASA. Retrieved November 5, 2015. ^ Stratford, Amanda (January 12, 2010). "NASA's new image". Florida Today. Melbourne, Florida: Florida Today. pp. 1A. ^ Dean, James. "KSC Visitor Complex introduces 'Heroes and Legends'". Florida Today. Retrieved August 6, 2015. ^ "Iconic KSC countdown clock gets a new home". News 13. March 1, 2016. Retrieved March 2, 2016. ^ a b "Historic Properties at Kennedy Space Center As of January 2015" (PDF). Environmental Planning - Cultural Resources. NASA. Archived from the original (PDF) on March 3, 2016. Retrieved November 5, 2015. ^ "UNDERSTANDING NASA'S HISTORIC DISTRICTS" (PDF). ENVIRONMENTAL PROGRAM AT KSC. NASA. June 2008. Archived from the original (PDF) on November 17, 2015. Retrieved November 5, 2015. ^ "Environmental Planning - Cultural Resources". ENVIRONMENTAL PROGRAM AT KSC. NASA. Archived from the original on September 22, 2015. Retrieved November 5, 2015. ^ "NASA's Historic Preservation Program: Celebrating and Managing Significant Historic Resources" (PDF). NASA. Retrieved November 5, 2015. ^ Oliver, John E. (2005). Encyclopedia of world climatology. Springer. p. 452. ISBN 978-1-4020-3264-6. ^ "Lightning: FAQ". UCAR Communications. University Corporation for Atmospheric Research. Retrieved June 17, 2010. ^ "NASA Checks Shuttle After Lightning Strike Near Launch Pad". Space.com. Retrieved October 19, 2017. ^ "NASA Assesses Hurricane Frances Damage". NASA Press Release. 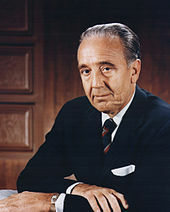 ^ NASA – Biography of Dr. Kurt H. Debus. Nasa.gov. Retrieved on May 5, 2012. ^ NASA – Biography of Lee R. Scherer. Nasa.gov. Retrieved on May 5, 2012. ^ NASA – Biography of Richard G. Smith. Nasa.gov. Retrieved on May 5, 2012. ^ NASA – Biography of Forrest S. McCartney. Nasa.gov. Retrieved on May 5, 2012. ^ NASA – Biography of Robert L. Crippen. Nasa.gov. Retrieved on May 5, 2012. ^ NASA – Biography of Jay F. Honeycutt. Nasa.gov. Retrieved on May 5, 2012. ^ NASA – Biography of Roy Bridges. Nasa.gov. Retrieved on May 5, 2012. ^ NASA – NASA KSC Director Announces Retirement. Nasa.gov (February 24, 2008). Retrieved on May 5, 2012. ^ NASA – Biography of William W. (Bill) Parsons. Nasa.gov (February 24, 2008). Retrieved on May 5, 2012. ^ "Cabana to Succeed Parsons as Kennedy Space Center Director" (Press release). NASA. September 30, 2008. Retrieved September 30, 2008. ^ Dean, James (March 17, 2011). "NASA budget woes leads to layoffs". Federal Times. Retrieved August 21, 2011. ^ Peterson, Patrick (November 28, 2010). "High-paying jobs scant outside KSC". Melbourne, Florida: Florida Today. pp. 1A. ^ Dean, James (November 5, 2011). "Laid-off KSC workers' supplies eagerly accepted by educators". Florida Today. Melbourne, Florida. pp. 2B. ^ Sangalang, Jennifer (January 19, 2018). "Hey, girl: Casting call for Ryan Gosling movie 'First Man' at Kennedy Space Center". Florida Today. USA Today Network. Retrieved January 30, 2018. ^ "Armageddon Production Notes". Michael Bay. Retrieved January 30, 2018. Reynolds, David West (September 2006). Kennedy Space Center: Gateway to Space. Buffalo, New York: Firefly Books. ISBN 978-1-55407-039-8. Retrieved January 30, 2010. Wikimedia Commons has media related to Kennedy Space Center. Wikivoyage has a travel guide for Cape Canaveral. This page was last edited on 18 April 2019, at 19:27 (UTC).